BEAUTIFUL UNIT This is a stunning and rare unit with a balcony and ensuite laundry, that has been fully renovated to the highest standard. Beautiful decor carefully chosen to current trends. 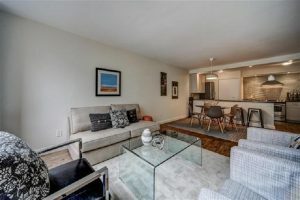 GREAT LAYOUT Spacious 2 bed, 1.5 bathrooms with balcony. EXCELLENT AMENITIES 24hr concierge, gym, indoor pool, rec. room, sauna, squash/racquet court, rooftop deck/garden,. WONDERFUL LOCATION Horizon on Bay is one of the most central Residences in downtown Toronto. Literally steps away to subway, shopping, streetcar, eateries, universities, hospitals, theatres.